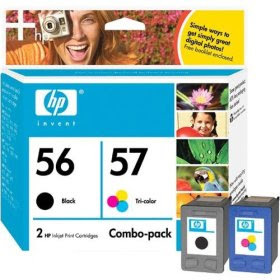 For a while, I’d needed new black & tri-color cartridges for my Hewlitt-Packard printer, which I, uh, “inherited” in 2003. In all that time I’ve had no problems with it, not that I use it a lot. So I went to Target and bought the combo pack, which gives me both cartridges at a bit of a discount — $48.49, to be exact. I install the cartridges and it prints out a test page. I throw out the test page and forget about the printer. One day last week, I find that the fiance tried to print something — to no avail. It doesn’t recognize that there’s ink in the cartridge. I try the old cartridges (yes, I still had them for some odd reason) and find that THEY will work. So I troubleshoot a bit and find that it’s the new tri-color one that’s the problem. I no longer have the box, so returning it to Target isn’t an option. I decide to take a shot at the HP online customer service. Within two hours, I receive a reply from a real person, asking me to follow a few steps to clean the cartridge. I comply, going through the process twice. It doesn’t work, and I respond with the sad news. Amazingly, the customer service rep tells me that they will send me a new cartridge at no charge. In a week, I will have a replacement cartridge. I am amazed!